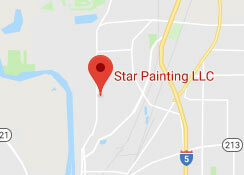 Star Painting LLC has years of experience bringing painting services for homes in businesses in Four Corners, Oregon. Our team takes pride in delivering high-quality work and is committed to 100% customer satisfaction for every job we do. Get your painting done by an award-winning business. Contact us today! We provide reliable painting services in Four Corners, OR for the smallest to the biggest projects. Our dedicated, in-house painters consider the details. Painting your home or business couldn’t be simpler. It just takes a single phone call. With over 5,000 households in the area, Star Painting LLC has done plenty of work here. Are you ready to get started on yours? Talk to us about how we can improve your interior or exterior paint. We are also certified to handle lead-based paint, so if you live in a home built prior to 1979, our team can safely handle and dispose of hazardous building materials. Four Corners is not just an area of Salem, but its own census-designated city in Marion County. Located on the outskirts of Salem’s urban growth boundary, Four Corners is the name of the intersection of State Street and Lancaster Drive. Star Painting is one of the rare painting contractors who offer free consultations. we want you to feel confident in your choice to work to with, so this is a great opportunity to get to know us, our processes, and what makes us an award-winning home and commercial painters.